I'm a sucker for anything oversized. Some find that it makes their frame feel shapeless, but I personally think an oversized look adds dimension,and a bit of "chic" to any ensemble. love flared jeans! great outfit choice! I agree! Oversized silhouettes add such a timeless chic edge to any outfit -- think culottes and oversized but tailored coats. Loving the look, Leah! This is definitely a great business casual outfit...the oversized jacket looks great! The pop of leopard is such a great way to spice things up! Lovely outfit! 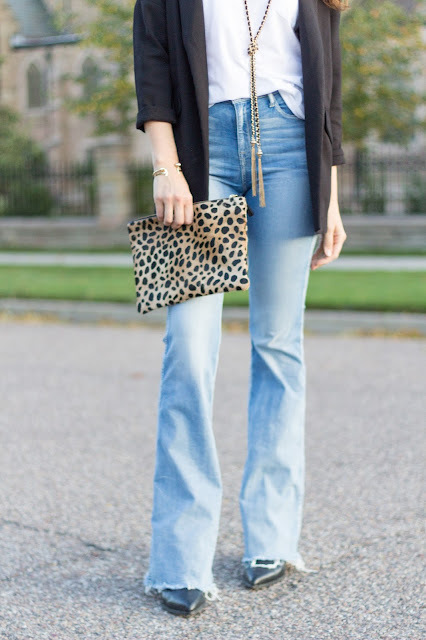 great classic look - really love the frayed hem & pop of leopard! Killin it!!! Obsessed with those flares! The high waist is gorgeous and I love them with the blazer! Totally love that blazer, babe! Looks so chic with the flares. Guys are always interested about learning about the body language of an interested woman, but there is one thing they miss. Maybe this is even more important than knowing everything about they body language of a woman. But, what is it? Knowing about their own body language! That oversized blazer is a great staple! Love the look! Love the oversized blazer on you! The clutch is super chic touch! I love the effortless and chic flare of your outfit! Those jeans fit you like a glove.